If technical cookies are necessary for the functioning of the site, the others require an authorization from you. 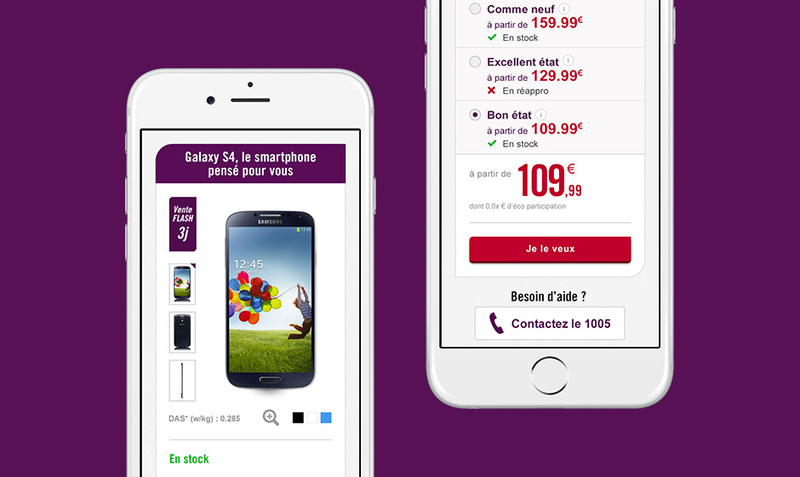 Reinventing the online buying journey to deliver peace of mind about mobile. To create a simpler, more fluid buying journey on Virgin Mobile, reflecting the brand's trademark quirky style, as part of the overhaul of the online store. To increase the online conversion rate with an enhanced customer experience, accessible on all devices, and to make our client the leading digital player in its market. In response to greater customer volatility and falling market prices, we created a device-independent website with multiple buying journeys, and identified key touch points where the mobile telephony brand could showcase its knowledge and expertise. We wanted prospects and customers to develop a genuine relationship with the brand, so we needed to develop simpler, more intuitive and compelling journeys that genuinely helped customers to find what they needed at the right price. We completely overhauled the design of the website by developing a brand-new architecture and features, as well as an appealing visual style that reflected the brand’s quirky tone. We also had two technical challenges to surmount – making the code more stable and, in turn, making the site easier to maintain. On these aspects, we worked directly with Virgin's Mobile’s CIO. 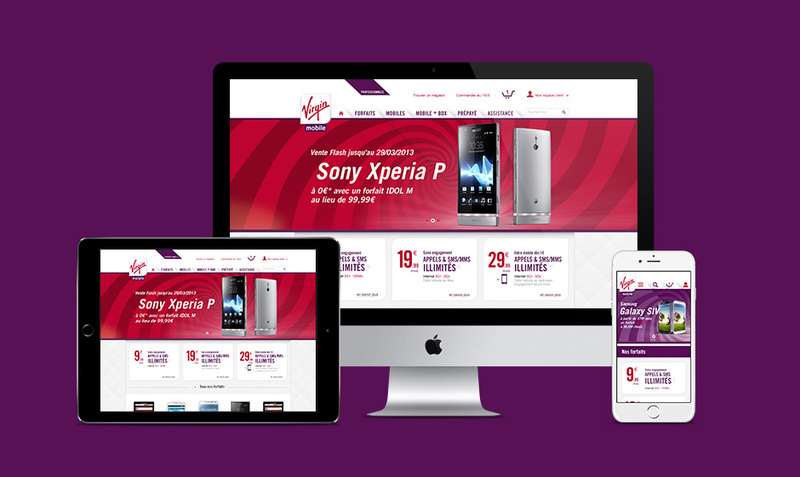 Simplifying and promoting Virgin’s offering When deciding how to overhaul the organisation of the website, we considered the various possible scenarios and looked to deliver a clearer, more transparent buying experience. We then established a framework that presented the most suitable offer for each customer’s needs, based on the predefined user contexts. Creating a bespoke, flexible and scalable platform We realised that our solution had to be able to adapt to complex situations, such as regularly updated sales campaigns, new offerings and different devices. We combined Symfony 2 with front-end technologies such as bootstrap and AngularJS to deliver an easy-to-administer front-end, capable of responding quickly to the fast-paced nature of the mobile telephony market. We also used a J2EE gateway to keep the front-end entirely separate from back-office order management processes. By combining these two areas of expertise, we were able to deliver a robust yet scalable solution. 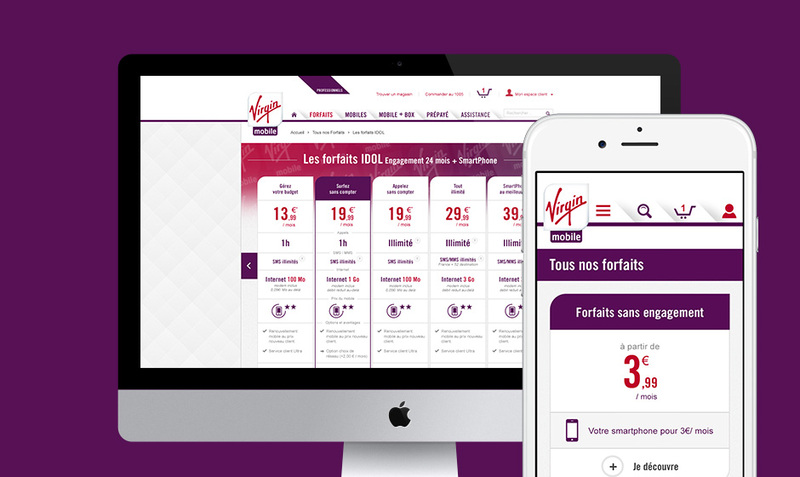 Adopting a multi-disciplinary approach, internally and externally One of the key challenges of this project was to ensure that Virgin Mobile’s communication, marketing and information systems teams were fully involved and kept up to speed at all times. We therefore organised and led a series of discussion and practical workshops with these teams, where we identified each business line’s key priorities and imperatives and proposed relevant design and technical solutions. Delivering design and technology support We managed the overhaul end-to-end to create a fluid buying journey, focusing on 40 key screens and building a custom, targeted team for the project. We had to turn the project around to short time scales and had to ensure flawless coordination between design and delivery. An always-accessible e-commerce site offering a visually appealing, user-centric buying experience that guides customers through the buying process right through to conversion. Here at Virgin Mobile, we are currently making a deliberate transition to digital. One of the first stages in this process was to overhaul our online store. We don't just use our e-store to sell mobile tariffs. We use it to handle often complex promotions, upsell devices, and deliver flexible and scalable buying journeys. It therefore needs to be flexible enough to respond to the fast-paced nature of the market we operate in. We turned to Niji to help us realise this ambition, and we weren't disappointed. They turned the project around to extremely tight time scales, and assigned the right people and skills to the job. The new site launched a year ago, and we now have a solid technical foundation that's enabled us to handle change requests effortlessly. We overhauled the look and feel of the business app, allowing sales staff to provide targeted, personalised offers based on loyalty card information. We provided consulting services and produced a detailed roadmap to provide a clear overview of the outlet and customer journey digitisation process for two of the food giant's flagship brands. We helped our start-up client to define the fundamental aspects of its brand identity. We created a showcase to host distributors in a leading marketplace, combining well-being advice and services for cats and dogs. We overhauled the look and feel of the client's on-board software in its payment terminals for press and cigarette dispensers. In total, there are more than 6,000 machines installed at more than 5,000 local outlets.